Grand Theft Auto V is an action-adventure video game developed by Rockstar North and published by Rockstar Games. It was released on 17 September 2013 for PlayStation 3 and Xbox 360, on 18 November 2014 for PlayStation 4 and Xbox One, and on 14 April 2015 for Microsoft Windows. 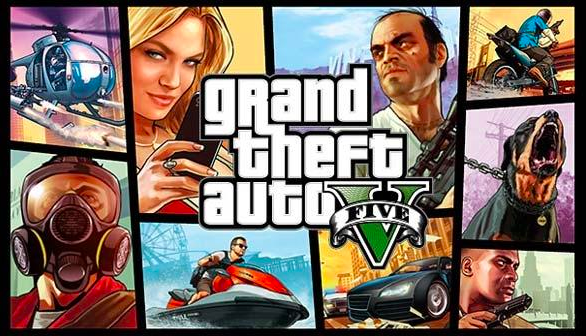 It is the first main entry in the Grand Theft Auto series since 2008's Grand Theft Auto IV. Set within the fictional state of San Andreas, based on Southern California, the single-player story follows three criminals and their efforts to commit heists while under pressure from a government agency. The open world design lets players freely roam San Andreas' open countryside and the fictional city of Los Santos, based on Los Angeles. The game is played from either a third-person or first-person perspective and its world is navigated on foot or by vehicle. Players control the three lead protagonists throughout single-player and switch between them both during and outside missions. The story is centred on the heist sequences, and many missions involve shooting and driving gameplay. A "wanted" system governs the aggression of law enforcement response to players who commit crimes.